Watch All The LeMons South Action, Live! 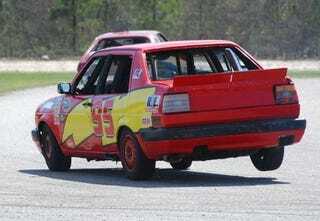 Remember the TrackGeeks' live streaming video of the 24 Hours Of LeMons South Spring? It's back for LeMons South Fall! Just go here to tune in. The LeMons Supreme Court and its extremely fair penalties should get some coverage, but for the most part you'll be watching $500 race cars drop bumpers and throw rods roar around the track.